Syrian Rebels Leave Homs In Cease-Fire Deal : The Two-Way The rebels surrendered the city to President Bashar Assad's forces as part of an agreement that gave them safe passage. 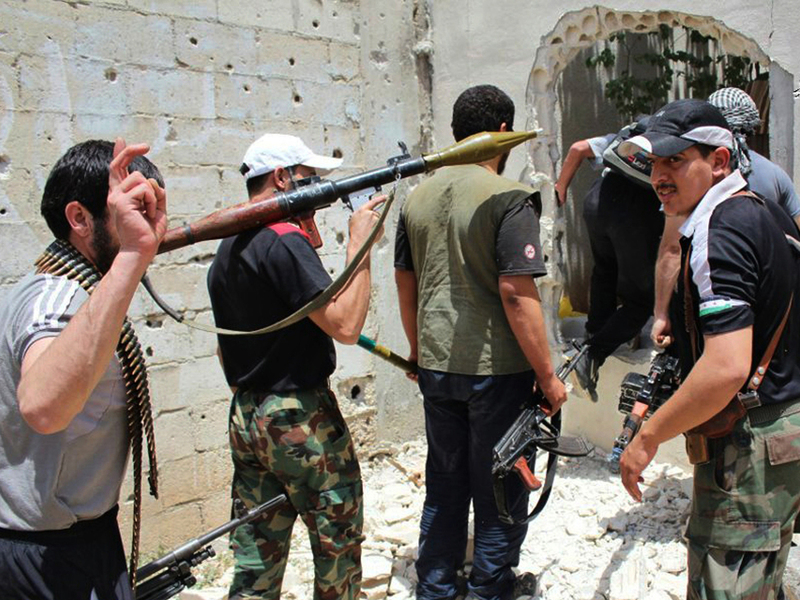 A photo from June 2012 shows Syrian rebels in Homs. The last of the insurgents were leaving the town on Wednesday under a cease-fire deal. Syrian rebels were retreating from the besieged city of Homs on Wednesday, surrendering the "capital of the revolution" to President Bashar Assad under a cease-fire that gave them safe passage to other insurgent-held areas of the country. The governor of Homs, Talal al-Barazi, was quoted by the state news agency Sana as saying some 2,000 people would be evacuated. Local activists said the first 600 to leave were wounded fighters and civilians. The evacuation from Homs took place under a cease-fire deal announced on Friday. "The rebels' departure marked the effective end of a more-than-two-year campaign by opponents of President Bashar Assad to control the country's third largest city. It came amid a series of government successes in expelling rebel units from population centers in central Syria and around the capital, Damascus." "For Assad, it is a powerful victory ahead of [June 3] presidential elections. For the rebels, the dramatic exit after two years of enduring grueling assaults and siege captures their sense of abandonment amid world reluctance to help shift the balance of power on the ground. "'We ate grass and leaves until there was nothing left for us to eat,' said opposition activist Abu Yassin al-Homsi, who was preparing to leave with the rebels later Wednesday. 'We kept urging the international community to lift the siege but there was no response,' he added."